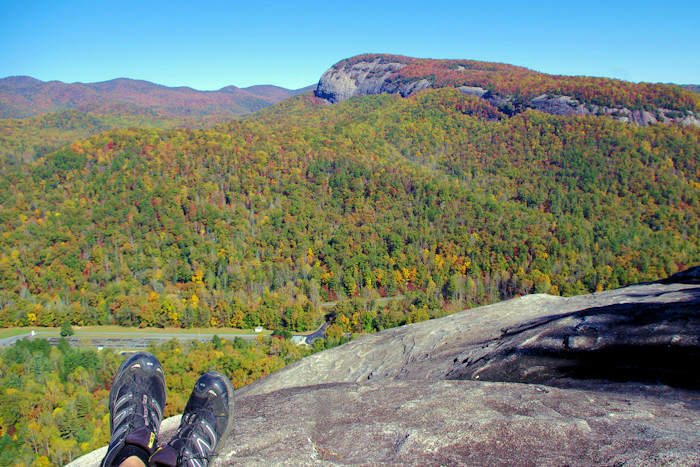 John Rock in the Pisgah National Forest is a wonderful five-mile loop hike with a good climb that affords wonderful valley and mountain views, including neighboring Looking Glass Rock, from the smooth rock summit. 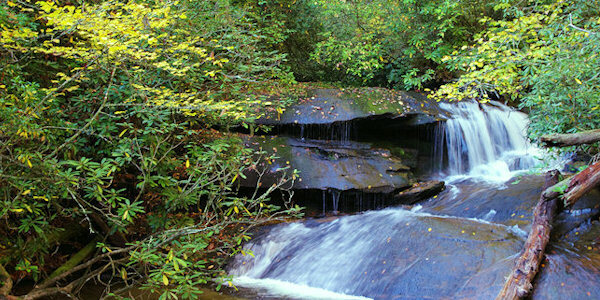 The John Rock trail is easy to access - park at the Pisgah Center for Wildlife Education and the State Fish Hatchery near Brevard. 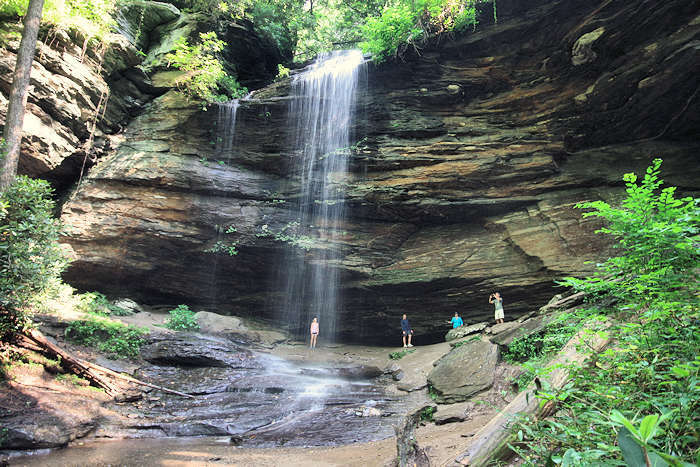 Enjoy wildflowers and Cedar Rock Falls along the hike as you climb 1,000 ft. in elevation to the summit at 3,320 ft. 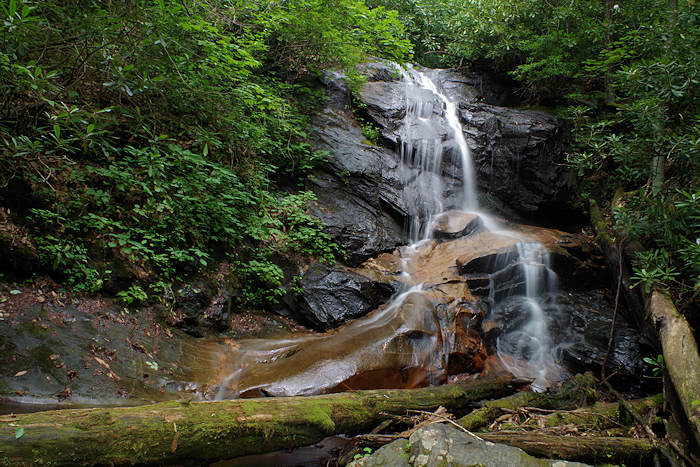 The hike is about 38 miles from Asheville, near the trailhead to the Looking Glass Rock hike and just down the road from Looking Glass Falls and Sliding Rock. (About 10 miles from the Blue Ridge Parkway). 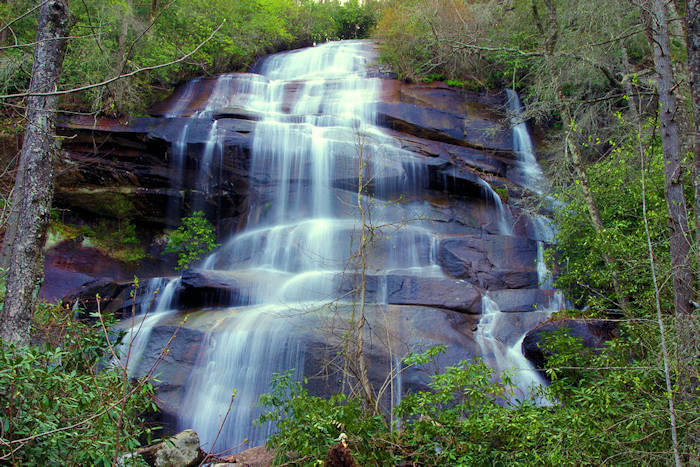 Only a few miles away are Daniel Ridge Falls, Log Hollow Falls, Cove Creek Falls and Slick Rock Falls. Begin the hike from the parking area by following Forest Service Road 475C (past the "authorized vehicles" sign) on your left if you are facing the Wildlife Center. After you walk around the gate and cross a bridge, turn right onto the Cat Gap Loop Trail, follow orange blazes and start your hike through the forest. About a mile up the trail you will hear a waterfall. 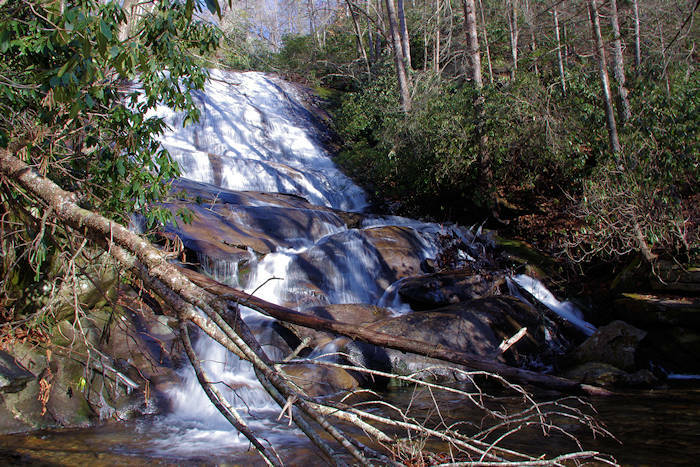 Immediately look for a short trail to the left to Cedar Rock Falls. It's a short and easily-missed trail (about 1/4-mile down to the waterfall). Head toward the sound of falling water and you will come to some rocks that you can carefully climb down to the base of the falls. After you return to the main trail, you will find another small waterfall near a camp site on the left. 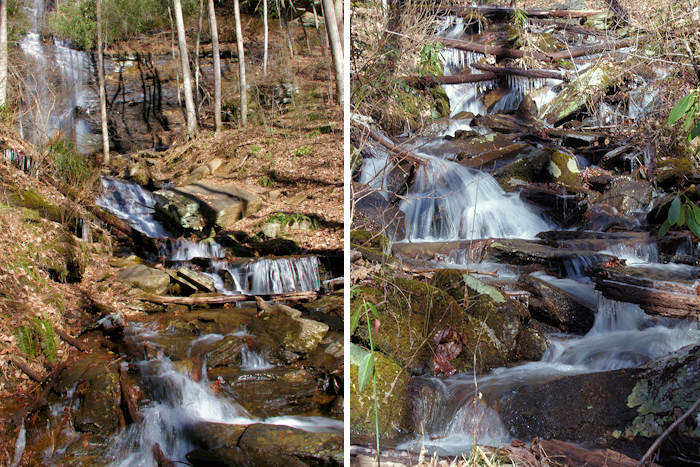 As you continue to climb the mountain on the main trail, you'll cross a mountain stream several times on log bridges. At the intersection with the Cat Gap Connector trail, turn left onto the Cat Gap Connector. At the next trail intersection, turn left on the yellow blazed Cat Gap Bypass trail. This section of trail is about a 1/2-mile long and avoids the climbs to the highest point on the Cat Gap loop. This section is mostly flat as it follows the side of the hill. Soon is a four-way intersection. The Cat Gap Loop trail comes in on the right and leaves straight ahead. To the left, look for the "John Rock" trail sign and begin the steepest part of the trail. 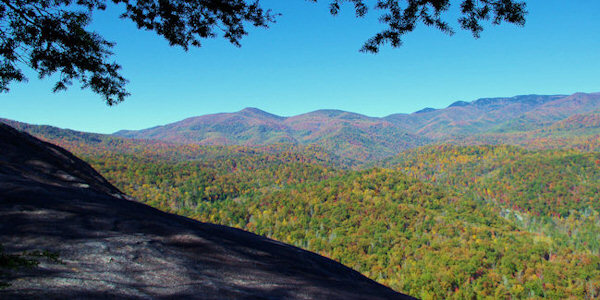 After reaching the top of the knob, you'll head gradually down again toward John Rock. This is the highest point on the hike, at approximately 3,320 ft. in elevation. There is one more short climb, then another descent before you reach the stone face of John Rock. Be careful on the rock since you're atop a 200-ft. cliff. But, there are plenty of level areas on the rock near the forest line. Rocks are slippery when wet. It's a great spot for a picnic or wildlife watching with binoculars. After you're done soaking up the views, head along the edge of the woods to your right and pick up the John Rock Trail heading downhill. The trip back to the parking area is shorter, connecting to the Cat Gap Loop again (orange blaze) downhill. You'll end your hike along a tranquil section of the Davidson River. You can pick up a map at the Wildlife Center. Directions from Downtown Asheville (about 36 miles): Take I-240 West / I-26 East. Continue on I-26 East to Exit 40 for Highway 280 (and the Asheville Airport). Take a right onto Highway 280 West and go 16 miles toward Brevard. As you enter the Brevard area, you will see a big shopping center on the right (with Wal-Mart). Just past the center, turn right onto US Highway 276 North (Forest Heritage Scenic Byway) to enter the Pisgah National Forest. Go 5.3 miles and turn left at the sign for Pisgah Center for Wildlife Education and the State Fish Hatchery. 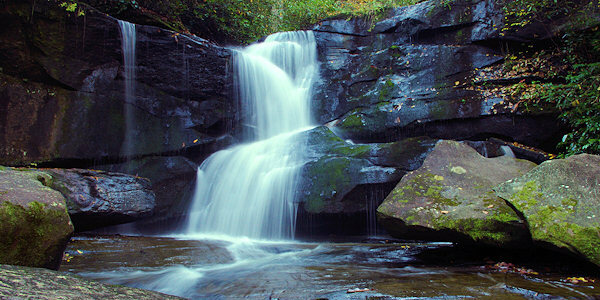 See our Pisgah Forest Waterfall & Hiking Map. The commemorative Camp John Rock plaque reads "This monument is dedicated to the young men who served in the Civilian Conservation Corps, 1933 - 1942. During the Great Depression, three million unemployed young men found meaningful work in the President Franklin Roosevelt's CCC. Known as the "Tree Army," the CCC worked out of camps on Federal and State lands to improve America's forests, parks and agricultural lands. Our country is indebted to the CCC for their conservation of our lands and their contribution to public recreation. Here stood Camp John Rock (F-1, F-28), the finest established on U.S. Forest Service lands in North Carolina, where Companies 402 and 428 served between 1933 and 1941."